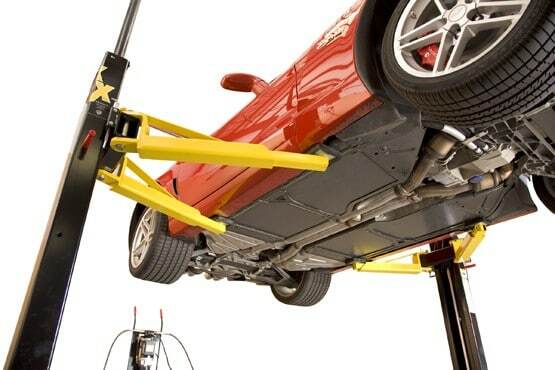 For portability, compact storage, and convenience, no automotive lift on the market today compares to the Patented MaxJax Portable Two Post Lifting System by Dannmar. 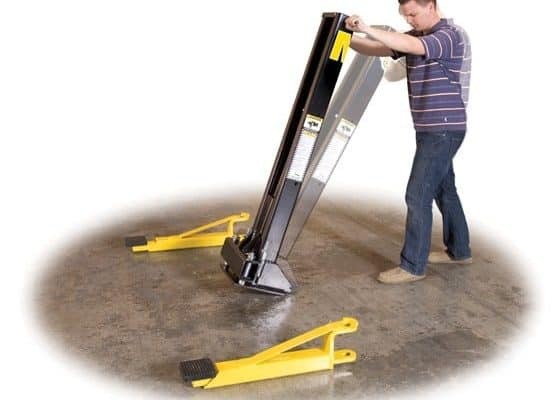 This portable two post lift is perfect for low-clearance ceilings and home garages. Need a quick oil change? Don’t have the room for bulky four post and two post lifts? Need to be able to use vehicles lanes when not working on your vehicles? Well need no further because the MaxJax Lift gives you all the convenience of a regular two post lift, but without permanently taking up a vehicle lane. 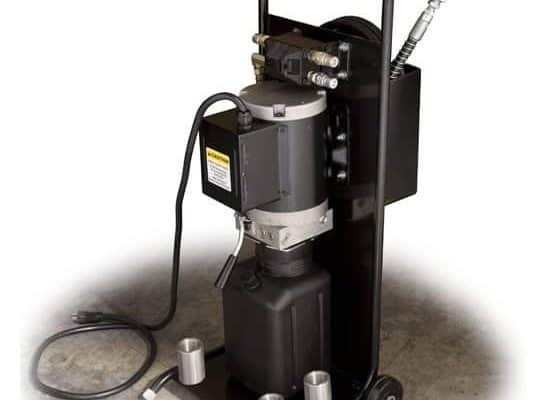 Standard accessory kit including (2) hoses, (4) rubber contact pads, (4) 3″ stackable adapters, (10) standard concrete wedge anchors, (1) set quick-connect fittings, and (1) set miscellaneous fasteners/bolts. It’s the features you get that set the MaxJax apart from the rest. Every MaxJax unit is loaded with the right features that make it the best choice when looking for a new auto lift. Read through the long list of features this car lift has to offer and you’ll easily come to the conclusion that the MaxJax is no ordinary garage lift. A cast iron gear flow divider is the heart of the MaxJax™ system, providing precisely equalized lifting. The specially designed flow divider/combiner is a positive-displacement fluid control device with precise flow division of hydraulic power from one column to the other even if load balance pressures change. Our standard mobile power unit cart is small enough to be stored out of the way and features a storage area for the hydraulic hoses. 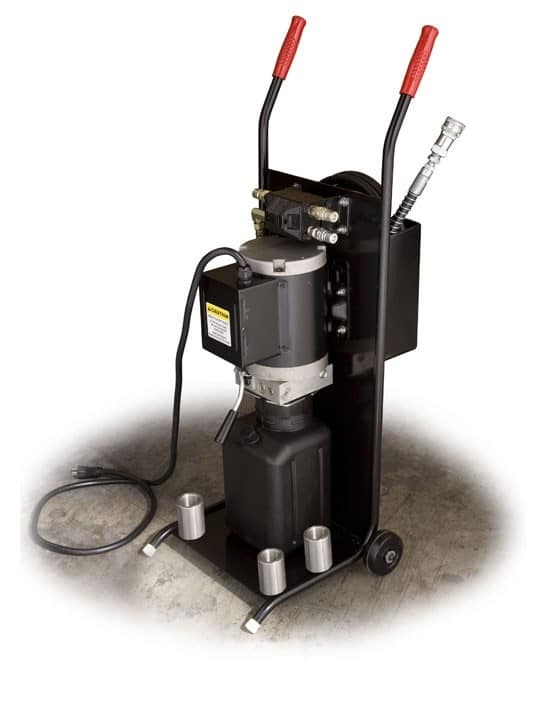 The hydraulic power unit uses a dual voltage single-phase motor that requires 110 volts AC and a 20 amp breaker, or 208-230 volts AC and a 15 amp breaker. The industrial grade power cord is 6-Ft. long. A simple push-button switch raises the lift and a push lever controls the lowering. Simple quick-disconnect hoses can be positioned easily for single or dual column operation. No other low-rise or mid-rise lift system provides more undercar clearance and unobstructed floor space than the MaxJax™ lilting system. Now you can easily access engine undersides, transmissions, drive-shafts, starters, differentials or anything else requiring undercar access. 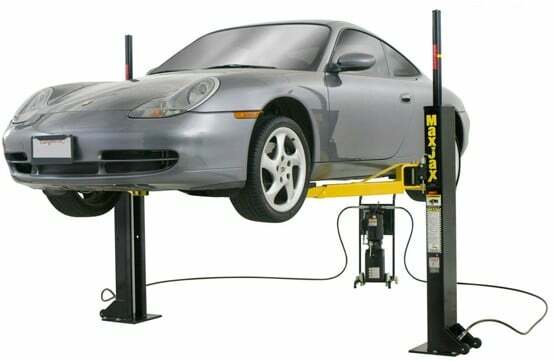 A two-post car lift with built-in wheels that allows you to use the lift when you need it, then conveniently store it out of the way when not in use keeping your garage and vehicle lanes clutter-free. 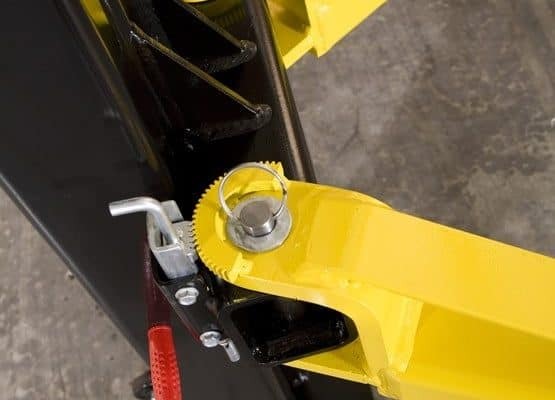 Internally threaded recessed drop-in anchors and quick connect/disconnect hydraulic couplers provide for fast and simple set-up. 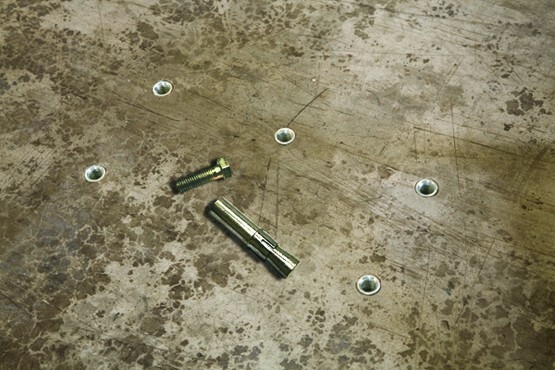 NOTICE – Before drilling into post-tension garage floors, always consult a building engineer for determining cable locations and where to avoid drilling. 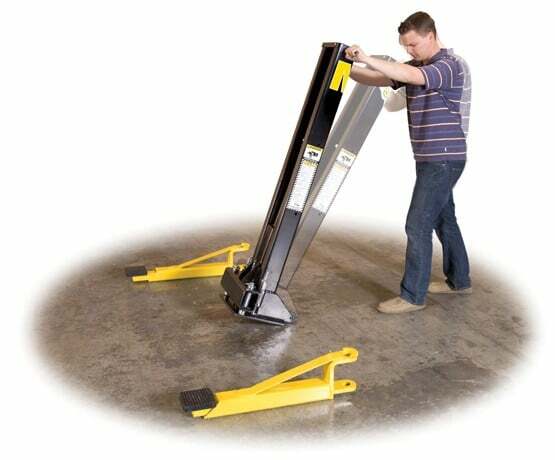 Increases overall arm positioning for lifting a variety of different vehicles that have Uni-body construction, OEM recommended pick-up points, or wide and/or narrow frame configurations. Each arm is equipped with durable arm restraints that automatically engage each time the lift is raised. When the lift is lowered, the gear type arm restraints automatically disengage to provide easy positioning of the lift arms. Rather than using roller bearings that need constant lubrication and maintenance, we use futuristic full-floating UHMW ultra-high molecular weight polyethylene load bearings that never need lubrication and last virtually the life of the lift. Our rugged safety lock bars are capable of holding three-times the rated lifting capacity making sure your vehicles are safely elevated and remain secure. Included with every lift are detailed installation and maintenance instructions, graphic safety and maintenance decals. The MaxJax™ Lifting System comes with an unprecedented 24-month limited warranty on lift structure and other lift components and a 12-month warranty on the power unit and hydraulic cylinders, and other assembly components. The lift can be installed at a width that suits the vehicles you will be raising. You may even choose to install additional anchors at varied column positions for adaptability to multiple vehicle configurations. Integrated into every MaxJax™ hydraulic cylinder is a one-piece, pilot fitted, machined steel piston wrapped with specially designed, pressure loaded U-cup piston seals, backups and wear bands that virtually eliminates any fluid bypass. The micro-smooth chrome-rod is machined from high yield, ground and polished C-1045/50 micro-alloy steel and plated to a minimum of .001″ diametrically, to ensure superior cylinder operation and life. Free-flow, high-pressure 3/8″ hydraulic lines and a high-flow pump and integrated AC power-unit increase ascent and descent speed rates for increased productivity..
Every MaxJax™ lift features a durable powder coat finish that gives the metal a high-quality, extremely durable finish which withstands even the harshest environmental or chemical conditions. Unlike other companies that claim to powder coat, we take pride in our meticulous 10-step process. 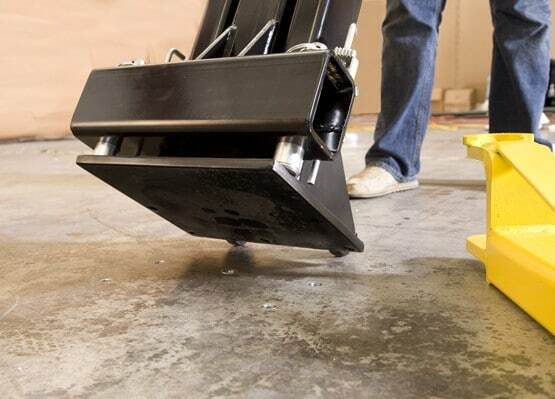 The MaxJax™ lifting system is designed with safety in mind. Dannmar’s 10-years of lift building know-how and dedication to craftsmanship and our use of only high grade materials is what makes the MaxJax™ lifting system one of the safest lifts on the market. No one in the industry has a more sophisticated and comprehensive research and quality control program than Dannmar, and our thousands of customers worldwide prove it. Low-pressure HVLP Direct-Drive cylinders eliminate the need for lifting chains or screw mechanisms most commonly found on other lift designs. Hydraulic cylinders feature integrated velocity-fuse safety valves. A cast iron gear flow divider provides precisely equalized lifting for uniform division of hydraulic power. 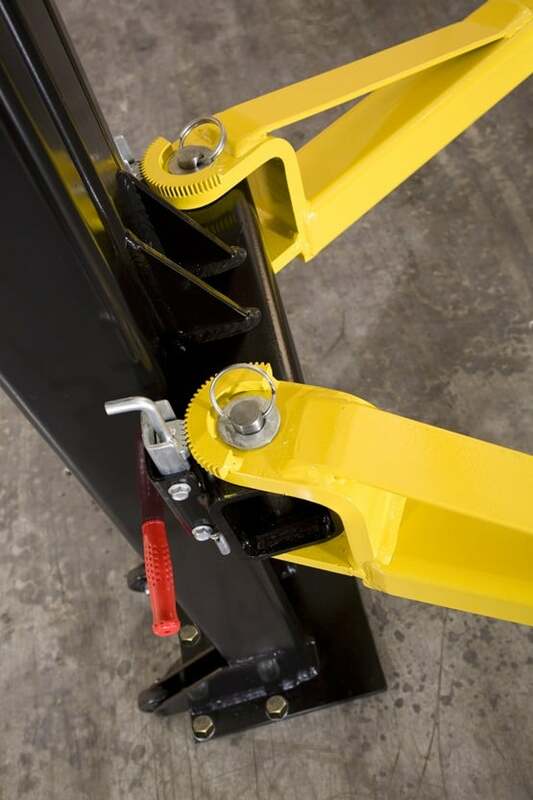 Rugged safety lock bars are capable of holding three-times the rated lifting capacity. Arm restraints automatically engage each time the lift is raised. Detailed installation, maintenance and safety instructions accompany each MaxJax™ lifting system. Dannmar encourages all owners to know their equipment and to follow good safety practices when using any of our products. Your MaxJax™ system equipment has been designed and built with your safety in mind, but the ultimate responsibility for safe operation is with you, the operator.